It’s time to look at the new Hero Academy film! With the franchise growing more and more popular it’s about time we got a full length film. The last few big films for the various Shonen titles like DBZ and Naruto have been great so I was confident that this one would be no exception. It definitely is a great film and continues the show well. While the heroes are still limited a bit by their own decisions, they at least help by the end and show the world that sometimes you have to step up. Once they get their hero licenses then it will be even easier for them. The film starts off with Deku and All Might heading over to America. They were invited by Melissa, genius inventor, to go say hi to David who used to be All Might’s partner. The two of them drifted apart over the years as All Might wanted to save people with his abilities while David wanted to retreat to his lab. Surprisingly David seems happy to see All Might and I’m glad the film didn’t go the drama route there. Most of Deku’s classmates have also decided to tag along for fun so Deku has to be careful that they don’t figure out his connection to All Might. The reunion is cut short though when villains attack the tower and take hostages. None of the pros can make a move so it’s up to the kids. The problem is that they don’t have their hero licenses so according to the regulations they have to ignore the terrorists. Can the heroes still save the day? Naturally it makes sense that in a world where 70-80% of the population have super powers there would be rules to restrict people from using their abilities at random. If everyone decided to play hero then there would be no point to the hero schools and the government would lose money. At the same time, you gotta realize that if someone’s in trouble in front of you then it’s time to act. I have little doubt that most main characters would reach this conclusion like Ichigo, Naruto, etc. The problem with Deku is he doesn’t really learn that lesson. In fact, the manga goes out of its way to teach him the reverse of it. There were several occasions where Deku stepped in to help out, but then he was rebuked by the adults for saving lives. It’s as ridiculous as it sounds. Sadly the words have stuck and since then Deku has started doing his best to follow the rules even if it means abandoning those in need. It’s a rather disappointing look for him in season 3, this movie, and be prepared for season 4 where he makes his biggest mistake yet. While I’m not saying that the rules shouldn’t apply to Deku, I’m saying that he shouldn’t care. You’ve always gotta make some tough choices on whether to follow the rules or not. The fact of the matter is that some rules and laws are simply bad and immoral. Others are seemingly harmless but depending on the circumstance they provide no benefit. This is one of those times. The rule makes sense, but must be ignored when people are in danger. The idea that these heroes are all around and simply don’t want to make a move because they can’t attack villains is terrible. Fortunately Bakugou and Todoroki completely ignore this once the fighting starts. That’s enough on the Deku part. He does good when he’s in a fight at least although he is heavily nerfed at different points to ensure that the film doesn’t end too quickly. It’s still a cool concept to be completely overpowered next to the rest of the case although the series rarely delves into that. Deku is a little out of character here with how easily he gets flustered and resorts to his pre arc personality, but he’s not bad either. He’s better than some of the other students. It’s probably no surprise here that Bakugo is the best character. He sees someone he doesn’t like and an attack is already underway. He won’t hesitate to make the hero call and his abilities are definitely really useful in a battle. While it will be hard for him to keep up with some of the other characters since his abilities can only improve so much, he won’t back down from a fight. Next up Todoroki is also pretty solid here. As always he is another one of the characters who thinks that fighting the villains is the right move. What puts him slightly under Bakugo would be the fact that he is more likely to listen to the others and not break the rules. His abilities are definitely quite solid though and they work a lot like Gaara’s. His tag team fight with Bakugo is definitely one of the better fights in the movie. It’s very fast paced and the more battles the better. The other classmates range from bad to just being around. I won’t really talk about the ones who were stuck at the hotel. Ochako is still too nervous throughout. She’s got a ways to go if she wants to be a pro her. Mineta and Kaminari look pretty bad here as they are ineffective in combat and aren’t even fighting for the right reasons. Kirishima and Jiro are all right, but don’t do much. Kirishima’s abilities are definitely quite useful though so the film makes sure to keep him away from the action. Can’t have too many heroes outshadowing the villains right? Now we get to the bad characters Iida and Yaoyorozu don’t look good here at all. As always they really like to listen to the rules even if it means letting everyone die. They’ve gone pretty far off the deep end. Iida is beyond redemption in the franchise and while Yaoyorozu isn’t quite as bad since she doesn’t try to get in the heroes’ way, she’s not much better. The two of them just don’t realize what it means to be a true hero and until they learn that lesson it is going to be hard for them to move up the ranks. They aren’t particularly helpful in the fight either as Iida forgot how to do basic maintenance on his tech and Yaoyorozu’s abilities are simply too defensive. As for the pros, All Might is really the only one who gets to do much here. As always he is the strongest by a long shot and it’s easy to see why he is the symbol of peace. In the flashback his design looked quite a bit different. Sort of like the overconfident athlete kind of character which works pretty well. He was always earnest and the overconfident appearance was simply his look, not his personality. It’s always nice to see him from back in the day although I don’t imagine he got a lot of practice in since the villains never seem to be in the same league as him. In the present he is naturally a lot weaker than he used to be. The film does a good job of keeping him out of the fight through the hostages since it doesn’t matter how strong you are if humans get in the way. Once the hostages are safe he is finally able to let loose against the villain. The final fight delivers as you could probably have guessed. Seeing All Might and Deku team up was a lot of fun. The other students also got to help and in a way that wasn’t cheesy. (Invisible Rasengan..) They were able to help clear the field for the two heroes while being aware of their limitations. The glove that Melissa gave Deku was also a nice way to see Deku go all out a little more than usual. Having such a gadget is definitely great and while it did shatter, it would be cool to see something similar be implemented in the manga at some point. This final fight had quite a few phases and climaxes so it certainly wasn’t rushed and was even a tad bit longer than I thought it would be. That is certainly a great thing. I also liked the final boss. He was a metal user who is a lot stronger than he seems. Even before the enhancement he is strong enough to give Deku a reasonable fight. Yes, Deku should have wrecked him, but we’ll assume that his shock simply slowed down his reaction times. The villain had a lot of great dialogue and a cool design. His super form at the end was also pretty neat as it had a bit of a cosmic look to it. All Might definitely had enough of the villains though as he attempts to murder them by blowing up their chopper as he got David to safety. There’s almost no way the villains could have survived that so it was a bit unexpected. I suppose since All Might knew he was going to change soon he figured that he had to wrap up the fight. It almost goes without saying, but part of what makes the fight so good is the stellar animation. The battles are very flashy with the action moving very quickly. The backgrounds are bright and a lot of nice details are in the film. It’s definitely theater budget. While there are 1-2 scenes where character faces are completely blank without any details, I have to assume that this was a stylistic choice similar to how All Might’s eyes are never shown to make him seem like his game face is always on. That’s always been a pretty cool look. The soundtrack is mostly just tunes from the show although I think we did get 1-2 new themes. The music is pretty sound and complements the film. As for the two original characters made up for the film, I can’t say that I was a big fan of David. The guy just doesn’t think things through and isn’t the smartest bulb out there. It’s hard to feel any sympathy for him to be honest. As for Melissa, she’s a fun character. She has good inventions and is a useful companion during the film. While she may not have a quirk, she doesn’t tend to panic and helps out whenever she can. You can’t really ask for much more than that. Naturally I do have to quickly mention Godzilla since part of the marketing for the film kept on showing him. Well, the bad news is that his role is extremely small. His screen time is less than 10 seconds in the entire film. That’s…..pretty disappointing for fans who were looking forward to his appearance. It’s not exactly the Legendairy experience that everyone was looking for, but I guess they weren’t milking his reputation for this film. Heh. I like the roar they used. As a casual Godzilla fan I couldn’t tell you which era the roar was from, but it was definitely retro. Overall, My Hero Academy The Two Heroes is a pretty fun film. It does a good job of hitting that balance between being an extended episode and feeling like a special adventure. The action scenes are solid and the pacing is really good. While a lot of the students aren’t really ready for these battles and make the wrong calls, they are still just kids so they have plenty of time to improve their game. It was nice to see America for a change along with this high tech island. A film is always a good time to take the characters out of their usual environment. The film also includes a recap at the beginning for people who haven’t seen the anime. It’s pretty well done and includes all of the information that you would need so even if you haven’t watched the show I believe you could watch this and still understand what is happening. You’ll still enjoy it and while you may not get the 100% experience, it’ll still be a great time. 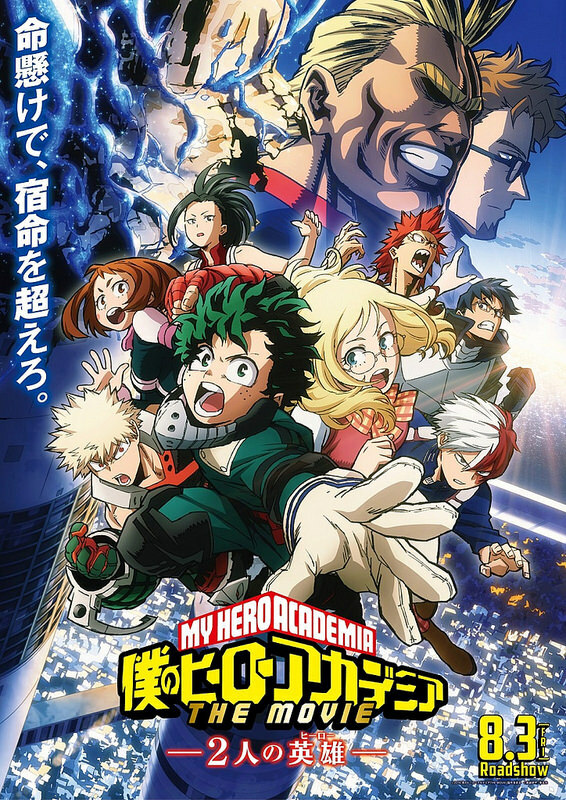 This entry was posted in Animated Movie Reviews, Animated Movies, Reviews and tagged Action, Anime, Anime Review, Film Review, MHA, Movie Review, My Hero Academia, My Hero Academy, Review, The Two Heroes by dreager1. Bookmark the permalink.